Soon another friend came over to Margherita’s house to visit. The three ladies admired the rose sitting next to Padre Pio’s photograph. That afternoon they had a wonderful time conversing together. After a time, Margherita happened to glance at the little table beside them. “Look,” Margherita said to her companions, “The rose is not in the vase. It has disappeared!” The women lifted up the table and looked on the floor. They looked to the left, to the right, in front and behind. They looked everywhere in the general area, but the rose was nowhere to be seen. “This is impossible,” Margherita said. “The three of us never left the house. We have been sitting here all afternoon. The rose was here and now it is gone. Things cannot just vanish into thin air!” There was absolutely no explanation for the occurrence. Needless to say, Giovanna and Margherita were shocked. Right before their eyes, they saw the miraculous rose. Giovanna said to Padre Pio, “Father, do you think I might be able to have that rose back?” “Of course you can,” Padre Pio replied. She took it home and put it in a frame. The rose would always remain one of Giovanna’s most treasured possessions. On January 20, 1936, Dr. Guglielmo Sanguinetti and several other men were visiting Padre Pio in his cell. As they were talking, Padre Pio suddenly interrupted the conversation and asked the men to kneel down with him and to pray. “We must pray for a soul who will soon appear before the judgment seat of God,” Padre Pio said. When they were finished praying, Padre Pio asked his friends if they knew who they had been praying for. They replied that they did not know. Padre Pio told them that they had been praying for George V, the King of England. Dr. Sanguinetti told Padre Pio that he had just read in the paper that the King’s health was not a cause for alarm. He had a head cold and no more. He was not in any danger. “What I am telling you is the truth,” Padre Pio answered. About midnight, Father Aurelio heard a knock at his cell door. When he opened the door, there stood Padre Pio. “Let us pray for a soul who at this very moment has passed away and is now appearing before the tribunal of God. I am talking about the King of England,” Padre Pio said. The two priests prayed together for a while. The next day, the newspapers announced that the King had died. His death occurred at the same time that Padre Pio and Father Aurelio were praying together for him. It was generally not Padre Pio’s habit to make statements about political or world leaders. However, at the time of King George V’s death, Padre Pio spoke of him and asked his friends to pray for his soul. It is not known whether Padre Pio had spoken of him at any other time. And what do we know of the King? We know that he was a man of faith and that he made it his practice to read from the Holy Scriptures every day. As a Protestant, he treated the Catholic Church with admirable respect. When George V became the King of England, he made a decision in favor of the Catholic Church. He refused to abide by the tradition in his country that called the Catholic Mass “superstitious and idolatrous.” History tells us that as the King of England, George was diligent and committed, and he influenced his country for good. Once a young woman was preparing to make a trip to the monastery of Our Lady of Grace in order to make her confession to Padre Pio. She also wanted to discuss some very important personal matters with him. Before leaving for the monastery, the girl’s mother, spoke at length to her about Padre Pio. Her mother then kissed the palm of her hand three times and made a request. “Just as I have kissed the palm of your hand, I ask you to kiss Padre Pio’s hand for me,” her mother said. As the girl was making her confession to Padre Pio, he gently brought the palm of his hand to her lips. The girl kissed his hand and then continued her confession. Two more times, he put the palm of his hand against her lips. She had no idea why he did so. After the confession was over, she walked out into the courtyard in front of the church. She told several people who were standing nearby about her confession to Padre Pio. She explained how he had pressed his hand to her lips. She asked them if they knew why he might have done so. None of the people had an answer to her question. It was not until the next day that the girl finally realized what had happened. Padre Pio was granting her mother’s wish. There was a woman who had received a great grace through the intercession of Padre Pio. She wanted to visit Padre Pio at the monastery of Our Lady of Grace and she asked her husband to take her there. Her husband was a devout Catholic, but he was skeptical about Padre Pio. He doubted all the claims he had heard about his sanctity. He finally told his wife that he was willing to take her to San Giovanni Rotondo but he did not care to speak to Padre Pio. During their days at the monastery, his wife tried to reason with him. “You have the opportunity to receive a blessing from Padre Pio and to have our son receive a blessing too. I am hoping and praying that you will take advantage of that opportunity,” his wife said. Finally, he gave in to his wife’s pleadings. The last day of the trip, he took his son to the place where the men waited for Padre Pio each day to receive his blessing. He stood off in the distance and hid himself in the shadows. After a time, Padre Pio came in. To some, he gave his blessing, to others he spoke a word of encouragement, and to others, he reached out and took the letters they handed him. When Padre Pio saw the man and his son, he turned to the son and said, “I know your name. Your name is Francesco Pio, just like mine.” Then he looked at the father and exclaimed, “I said that to your son in order that you would believe.” From that day forward, he believed. Luciano Livellara, who lived in Venice, Italy, was very concerned about his mother’s health. He traveled to San Giovanni Rotondo in order to speak to Padre Pio about his mother. After he made his confession to Padre Pio, he asked him to remember his dear mother in his prayers. As Luciano started to rise from the kneeler to leave, Padre Pio stopped him. “Now, about that other matter,” Padre Pio said. “Break it off immediately! Do you understand?” Luciano understood at once what Padre Pio was talking about. Luciano was deeply in love with a girl that he had been dating for a year. She had just recently told him that she was married. He had tried to end the relationship, but because of his love for her, he had not been able to do so. “I want to break up with her,” Luciano said to Padre Pio. “I have prayed about it and I have tried to end the relationship, but I have not been successful.” “Break it off immediately. Do it now!” Padre Pio repeated. Luciano got the message loud and clear. He went home to Venice, determined to do what Padre Pio had asked him to do. He never saw the girl again. Dr. Sciubba was one of Padre Pio’s spiritual sons. One day, he spoke to Padre Pio about one of his relatives who had decided to divorce her husband. The husband had mistreated her and was the cause of much unhappiness in the family. The marriage had become an “absolute disaster.” Dr. Sciubba believed that his relative was doing the right thing by seeking a divorce. Padre Pio did not agree with him. Each case was different, but in regard to this couple, Padre Pio did not feel that a divorce was the right solution. He told Dr. Sciubba quite frankly that the marriage should not be dissolved. Dr. Sciubba went back to his relative and told her that Padre Pio was not in favor of her divorcing her husband. She thought deeply about it and decided to change her course of action. She wrote Padre Pio a long letter, sharing some of her heartaches regarding her marriage. The next morning, she decided to go to the post office and mail the letter. Before she left the house for the post office, there was a knock on her door. To her great amazement, her husband was standing at the door. As it turned out, her husband had been to see Padre Pio to seek his counsel. He told Padre Pio that after many years of separation, he now wanted to reconcile with his wife. “Go to your wife and make up with her,” Padre Pio advised. “But I do not have the courage to do so,” the man replied. “I treated her badly and I am ashamed of my behavior. I do not feel like I can face her.” “Then tell her that I have sent you to reconcile with her,” Padre Pio said. “I am sure she would not believe me if I told her that,” the man answered. “Then tell her that I have already read the letter that she wrote to me,” Padre Pio said. Padre Pio then told the man some of the particulars in the letter, the letter that had not been sent yet. As the man stood on the front porch and faced his wife, he was able to ask her for forgiveness. “I want our marriage to work out,” he said. “I have been to see Padre Pio because I wanted to speak to him about our relationship and our future. He too wants our marriage to work out. He told me that you wrote him a letter in which you poured out your heart to him.” His wife listened to her husband’s words with amazement. She was the only person who knew anything about the letter. And yet, Padre Pio obviously knew the contents. He had told her husband about it. The woman could feel her husband’s sincerity as he asked for forgiveness. She was able to let go of the painful events of the past. The couple reconciled with each other and felt the happiness once again of a loving marriage. Father Agostino of Campolieto was visiting Padre Pio in San Giovanni Rotondo on one occasion and mentioned to him that he would soon be going back to Algeria. Padre Pio told him that there was danger awaiting him there and advised him not to go. Father Agostino thought about Padre Pio’s warning but did not feel that he could cancel his trip. When Father Agostino returned to Algeria there was a conflict that arose between the French people who lived in the country and some of the other ethnic groups. Because Father Agostino spoke French, he was considered a suspect. One night, at 11:30 p.m. the police came to his door and arrested him. At that moment, Father Agostino remembered Padre Pio’s words. He was taken to the police station and questioned. He was finally released at 5:00 a.m. the next morning. The Capuchins in San Giovanni Rotondo noted that Padre Pio became suddenly ill at 11:00 p.m. the same night that Father Agostino was arrested. He remained ill until five o’clock the next morning. Mario Amendola was one of Padre Pio’s spiritual sons. Mario had a cousin who had fallen upon hard times. He was out of work and penniless. He spoke to Padre Pio about his desperate situation. Padre Pio advised him to move to the city of Falconara. “I do not think that is a good idea,” the man said. “I have friends in Rome who can help me but I do not know anyone in Falconara.” Padre Pio advised him once again to go to Falconara. The man decided to follow Padre Pio’s advice. He moved to Falconara with his wife and children. One morning, a stranger approached him and said, “I work for the manager of a union. He told me that he would like to see you at his office.” The man went to the manager’s office and was offered an excellent job. The wages were more than he had ever hoped for. It was like a dream come true. How happy he was to have followed Padre Pio’s advice! Monsignor Gannon had an unusual experience on one of his visits to Padre Pio. After attending the afternoon holy hour at the monastery, he happened to see Father Pierino Galeone. For some strange reason, he had the irresistible urge to give Father Galeone some of his possessions. He took off his watch and gave it to Father Galeone. He also handed him his fountain pen as well as all of the money he had in his wallet. He could not explain his actions. He only knew that he had to do it. Father Galeone had his hands cupped to receive the items and he was laughing all the while. Monsignor Gannon asked him why he was laughing. “This morning when I saw Padre Pio, he told me that I would be receiving a number of gifts today,” explained Father Galeone. “But it is neither Christmas nor Easter. Why would I be receiving gifts?” Father Galeone asked. Padre Pio simply repeated again, “You will be receiving many gifts today.” Although the incident was indeed mysterious, Monsignor Gannon was happy that Padre Pio had used him to play a part in it. Angelo Tomasini was the father of eight children. When one of his sons became ill, Angelo prayed to Padre Pio and asked for his intercession. To Angelo’s great joy, his son was healed of his illness. Angelo was convinced that Padre Pio had answered his prayers. He decided to make a trip to the monastery of Our Lady of Grace in order to thank Padre Pio personally for his son’s recovery. He was able to take two of his sons with him on the trip. After taking a train to Foggia, Angelo and his two sons boarded a bus to San Giovanni Rotondo. Once they arrived in the little town, Angelo observed that there were only a few rooming houses available for visitors to the area. Unfortunately, they were all in very poor condition. Nevertheless, Angelo felt grateful that he was able to find lodging. The next morning, Angelo and his sons went the short distance to the monastery church of Our Lady of Grace. Angelo then stood in line to make his confession to Padre Pio. When Angelo’s turn came, as he began his confession, he noticed the unpleasant odor of sulphur in the air. He wondered if it had something to do with the sins that he was confessing at that very moment. He did not know. He had heard that people often perceived the heavenly fragrance of roses or lilies when they were near Padre Pio. But he was not so fortunate. As Angelo made his confession, Padre Pio stared intently at a spot on the wall, directly above Angelo’s head. He then started flicking at the invisible object with his forefinger and thumb. He seemed to be trying to drive away something that he saw there. Was it a spirit? Was it a demon? Angelo wondered but he did not know the answer. However, the unpleasant odor of sulphur still pervaded the air. Angelo knew that it was not a positive sign by any stretch of the imagination. After Angelo made his confession, he asked Padre Pio if he would accept him and his two sons as his spiritual children. Padre Pio replied that he would accept them. Angelo explained to Padre Pio that he had a wife and six other children who were not able to make the trip with him. He wanted Padre Pio to accept them also as his spiritual children. “Yes, I will accept them too,” Padre Pio replied. “I hope that you can come back to San Giovanni Rotondo again sometime. You can then bring all the members of your family with you,” Padre Pio added. Angelo thought of his family at home and was very happy to know that they would all be under Padre Pio’s protection. That afternoon, Angelo and his two sons attended the Benediction service in the monastery church. The next morning, they got up very early in order to attend Mass. During the Mass, Angelo knelt on the altar steps, right next to Padre Pio. Angelo noticed that while Padre Pio was saying Mass, his face, which was normally rather pale, was flushed with a red glow. Angelo began to doubt what he was seeing. His mind became flooded with negative thoughts. “This cannot be real,” Angelo said to himself. “My eyes are deceiving me. Padre Pio is a counterfeit.” Angelo knew that he was being tested. He had proof of Padre Pio’s holiness. There was no reason for him to doubt it. He had already experienced Padre Pio’s gift of reading of hearts, of miraculous healing, and more. Angelo talked back to the dark thoughts in his mind and before long they subsided. Shortly after Angelo returned home, he received notice from his employer that his job assignment was changing and that he was being transferred to a town not far from Rome. Angelo did not want to relocate to Rome. He was very happy where he was and he was afraid that the change would not be good for his family. However, Angelo had no choice in the matter. The first day on his new job, Angelo spoke to the authorities regarding the upcoming trial. He was told that he did not need to concern himself about it because everything has been filed away. Angelo couldn’t believe it. The very same words that Padre Pio had used were now repeated. The next time Angelo went to San Giovanni Rotondo, he told Padre Pio that he had been transferred and was now living and working near Rome. Padre Pio assured him that the move was going to be beneficial to every member of his family. 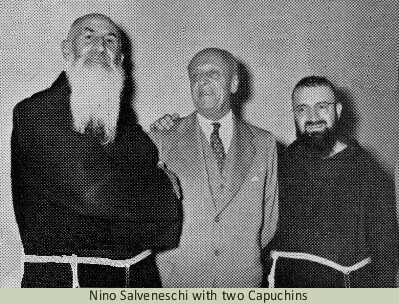 Nino Salveneschi made a trip to San Giovanni Rotondo in order to make his confession to Padre Pio. He also wanted to ask him for his counsel. In the confessional, Nino said to Padre Pio, “I came here to make my confession to you more than thirty years ago. I cannot remember whether it was 1923 or 1924.” “It was 1924,” Padre Pio replied. “It was in the summertime.” Nino was shocked that Padre Pio remembered him as well as the time of his visit. It seemed impossible. Later, Nino had confirmation from his wife of the exact year and the season of the year. It had actually been thirty-one years previously, in the summer of 1924. Even though San Giovanni Rotondo was just a small village then, Nino had to wait two days to make his confession. Nino remembered clearly that he stood in line behind Prince Radziwill of Poland. Everyone had to wait their turn in line and no one was given special privileges, no matter what their status or social rank. In the confessional thirty-one years later, Padre Pio advised Nino, who was a writer by profession, to always take great care to write books that would be uplifting and beneficial for people. Nino told Padre Pio of the cross he was bearing. He had lost his eyesight while living in Belgium, and wanted to know how he could best cope with the loss. Padre Pio advised him to try to accept the trial without bitterness or complaint. Nino thought of the words of Job in the Old Testament, The Lord gave and the Lord has taken away. Blessed be the name of the Lord (Job 1:21). At the conclusion of Nino’s confession, Padre Pio told him to go in peace and that he would remember him in his prayers. Even though his encounter with Padre Pio was short, Nino felt a great sense of peace. That peace remained with him in the difficult years that were to follow. In his many trials, he was able to feel Padre Pio’s presence. He later said that he felt that he owed his faith in God to Padre Pio.